There are lots of places on my burger to-do list. Some of them are places that are new to me, but a lot of them are places that I’ve been before but haven’t had a chance to try the burger. Case in point: Kite & Key, frequented many times during stops on the Craft Beer Express, yet never ordered from the food menu – until now! 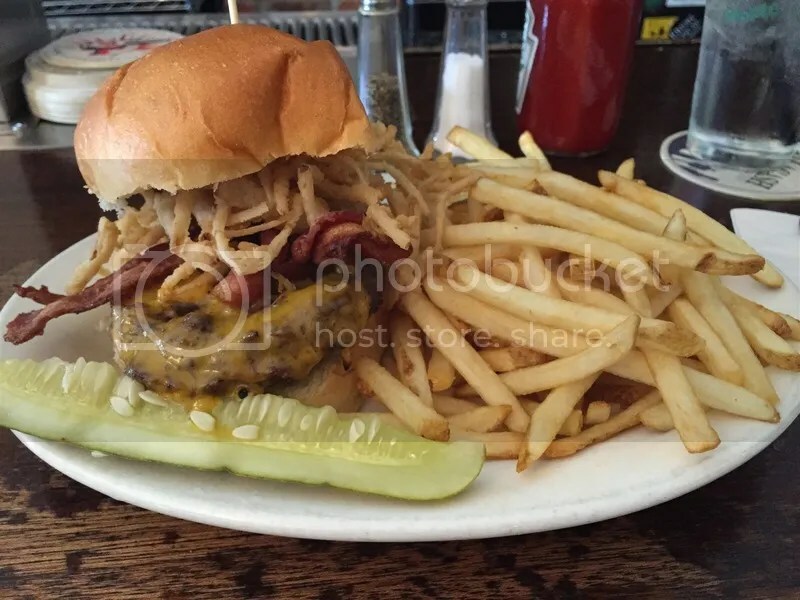 I stopped in for lunch to check out their signature Kite & Key burger, a ½ pound ground Angus beer patty topped with cheddar cheese, bacon and fried shoestring onions on a toasted brioche bun. The burger was ordered medium but came out slightly more on the medium-well to well done side, with a nice char on the outside of the patty. The bacon was nice and crispy and the onion strings gave everything a nice little crunch. The burger to bun ratio was perfect. While the burger itself may not have been as juicy as I would have liked, I still really enjoyed it. If you’re heading out for Philly Beer Week events this weekend, definitely swing by Kite & Key’s annual Throwdown in Franklintown event and fuel up with one of their burgers! Posted in bacon, brioche, brioche bun, burger, burgers, cheddar, cheese, Franklintown, Kite & Key, onion strings, philly burger week. Bookmark the permalink.